If you’re following via RSS, please add http://thoughtfulcampaigner.org/ to your RSS feed, or better still go to thoughtfulcampaigner.org to subscribe to get new posts automatically delivered to your inbox. One of the reasons that this blog has been so quiet over the last few months is that I’ve been busy working to get Campaign Bootcamp going. We ran the first Bootcamp back in June and it was AWESOME. Since then we’ve been working to try to do it again, and we are in March. I’m excited about the opportunity to build something that trains the next generation of campaigners and the community we’re creating (who were responsible for creating the film above). We’ve just 5 days until applications for the next Bootcamp in March close, so if you know up and coming campaigner, especially if they live outside the M25, please encourage them to apply. Deadline is 09.00 on Saturday 21st December. Please also tweet and share on Facebook. When it comes to elections, campaigners in the UK get very excited about the one happening ‘across the pond’ in the US. I’m one of them, and even 6 months later give me an article on data driven campaigning that helped Obama to win and I’ll be the first to read it. But is it time for us to stop looking west for campaign inspiration and instead start looking ‘down under’? The Australian elections might not have the glamour of the US but in many ways the comparisons between our political systems are closer, two main parties but plenty of feisty smaller ones, a constituency system with the leader of the biggest party in Parliament forming a government and an active campaigning sector. 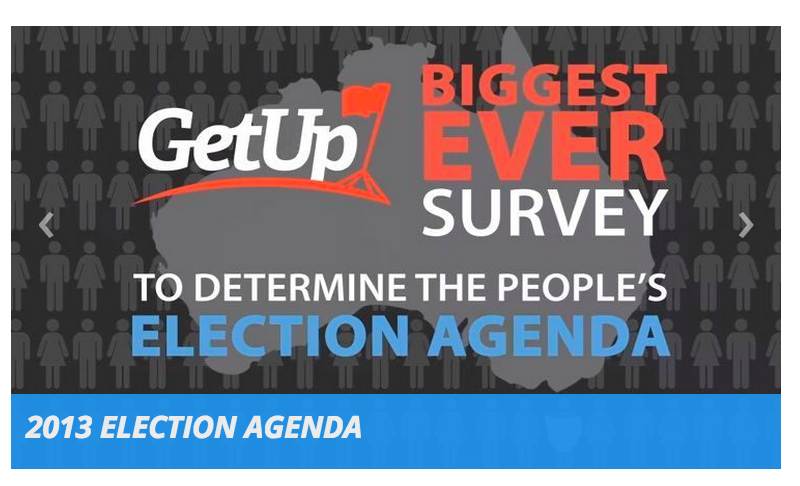 While there are clear differences, most notably in Australia voting is compulsory, any smart campaigner could do worse than follow the soap opera down under for the next 4 weeks ahead of the polls on 7th September to get some clues about how we might plan to influence the 2015 election here in the UK. GetUp! Live Webcast – The Australian equivalent of 38 Degrees are, as expected, making a big deal of the elections. I’m sure we’ll see lots of new ideas from them in the coming weeks, but I love how they’re starting by hosting a nightly weekly live webcast for their supporters to bring them the latest on what they’re doing and how the community can get involved (you can watch at 9.30am here in the UK). Learning from failure – The Centre for Australian Progress is playing a key role in coordinating groups and organising war rooms to help bring campaigners together. They’ve already planned to organise a FailShare to bring together groups that have been involved in campaigning around the election to learn from what didn’t work. The appetite to learn from what didn’t work as well as what did is brilliant. Engaging the grassroots – I’m biased on this, because I’ve been working with groups like Micah Challenge Australia for a number of year, but as well as the exciting and responsive digital campaigning, development groups have been coming together to form ‘Movement to End Poverty‘ with the aim of getting the issue of development aid on the agenda of the parties, focusing on local events as well as petition signatures. I’ll be keeping an eye out from other campaign lessons from Australia in the coming weeks. Do share what you’re discovering. Last week was one I won’t forget in a long, long time. Together with a group of wonderful friends, I helped to organise and run the first every Campaign Bootcamp (the video below shows a little of what we got up to). It was a dream that took almost a year to bring together, and is one of the main reasons that this blog has been so quiet in the last 6 months! The idea was simple, take 30 of the most talented and energetic emerging campaigners committed to building a more just, fair and sustainable country from across the UK and give them a week of training from some of the very best in the campaigning business, but also allow them to put those skills into practice in real-time. We had so much fun, and I’m incredibly excited about what we’ve started, but being at Bootcamp also taught me some invaluable lessons that I think might be useful for other campaigners to reflect upon. 1 – Let’s talk about power. It’s all too easy to dive right into learning about exciting new tactics. But we devoted the first day to understanding power and how change happens. It’s an issues I know that is a critical part of any training you might do with those involved in community organising, but something that I know I’ve been guilty of rushing over when I’ve run campaigns training before. Ensuring every campaign has a clear and robust theory of change is critical, but something we perhaps incorrectly leave to those who are more senior or have greater experience. 2 – Practice makes perfect. One of the central components of Bootcamp was running a scenario which participants had to run a campaign on. In real-time they we’re expected to write emails, build websites and consider how they should adapt their strategy to changes in the scenario. Some might see it as a giant game, but last week I saw it as an invaluable way of learning how campaigners react and respond under pressure. I saw it teach valuable lessons, and would encourage any campaigns team to put time aside to learn from the experience and ‘stress test’ there systems and structures before a real campaigning example does. 3 – Being deliberate about building community. Nothing builds a sense of community like going away together for a week. Now that might not always be possible but the value of eating, learning and relaxing together, rather than all packing up at 6pm each day and heading our separate ways built a real sense of community. As a team we were also deliberate about wanting to ensure we had a cohort of participants from across different campaigning communities together. It stuck me of how often campaigning happens in silos here in the UK. 4 – We need to teach the habits of highly effective campaigners. It would have been easy to fill the programme for the 6-days with learning on strategy and tactics, but as a team we wanted to put aside time to ensure that those attending left with habits to ensure they’re brilliant campaigners in 20 years rather than burnt-out ones. We didn’t always get the balance right (11am finishes anyone!) but I think everyone walked away with ideas and strategies to keep running the campaigning race for years to come. 5 – Everyone needs to learn code. For an afternoon, it felt like being back at school again, everyone in rows like in a classroom, laptops out and a teacher at the front as we followed exercises to help us learn HTML. It’s easy for many campaigners to assume that someone more technical can worry about the code, but with the web and email being key tools for our campaigning, having a basic understanding of HTML is a key skill to learn. I’d recommend Code Academy as a good place to start. It turns out that many of the problems can easily be solved with just a little expertise! 6 – Our sector is a hugely generous one. Throughout the week I was overwhelmed with the generosity we saw from existing campaigners. From sharing time as trainers and coaches, to donating money to joining our seed list and providing feedback on the emails that participants sent we experienced extreme generosity from others. It was something quite phenomenal and very special. Thank you to everyone who supported us in so many different ways. I know that I won’t be able to recreate that Bootcamp feeling again any time soon, but the lessons that I learnt along with the amazing energy that the participants I hope will stay with me for a long time. Helping to recruit new supporters into an organisation – especially at a festival or other event where making a financial ask can be seen as a ‘high barrier to entry’. Differentiating the asks we make of supporters – so we’re not always asking them to give us more money. Building loyalty of our organisation and reducing the attrition rate. But it’s not always been based on much empirical evidence to prove the point. The reality is that is doesn’t appear that we have a huge number of examples or studies to draw upon, but here are three studies that all provide evidence that campaigning is good for fundraising. 1. National Bureau of Economic Research Working Paper. Andreas Lange and Andrew Stocking in this 2009 Working Paper found that from a sample of 700,000 supporters of a large US advocacy organisation, that a person who takes an online advocacy action for your cause is seven times more likely to donate, compared with someone who does not take an online advocacy action. Working with Engaging Networks, PETA France demonstrated that advocacy is an effective way to engage lapsed donors. They sent out various emails on the issue of seal clubbing to a total of 22,000 supporters. As well as finding a correlation between level of activism and response rate, the more active the campaigner, the better the response rate. They also found that lapsed donors were significantly more likely to donate if asked to take action first then donate. Again working with Engaging Networks, found that directly integrating campaigns with donation pages as part of their Arctic campaign lead to a 1.23% response rate, compared to providing a donate link on the thank you page of the campaign action led to a best ever response rate of 0.4%. What other studies or examples have you found to demonstrate the links between campaigning and fundraising?